This post took me a very long time to research and write but I love researching about art that isn't in the mainstream. By the time I finally go and write the posts I've learned so much and then I pass that information into you. Enjoy reading. You hear the word Art Brut, what sorts of images does that word bring you your mind? For most it is raw or rough images come to mind and that’s it, raw art or art created outside the boundaries, hence the name, Outsider Art. Art Brut, translated from French means "raw art"; 'Raw' in that it has not been through the cooking process, those works uncooked by cultural and artistic influences. 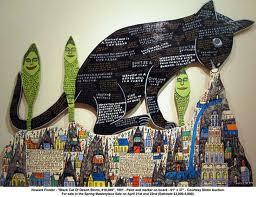 Art Brut, Outsider art or any of the terms used above aren’t limited to just painting. The artists that work within this genre may work in many mediums, drawing, painting, sculpture, fabric, some may create dolls or toys and soil whereby they create large visionary gardens, and others express themselves in writings laid out in a primitive format. You can read the entire post here and find books in the Arts Division about Art Brut and the Outsiders. You can read more posts I've written about art outside the mainstream here.